11:07pm – Big Brother sends the housemates a few bottles of alcohol which leaves them in total excitement. 9:33pm – During her diary session, Cee-C says she has Zero likeness for the Head of House Alex, Cee-C further says that Alex is TROUBLE and causes a lot of Drama in the house but everyone is ready to give it back to her. 9:32pm – Cee-C’s diary session. 9:26pm – During his Diary Session today, Lolu reveals to Biggie that during his childhood, he was molested by their housemaid for about 4 years. Lolu says that he was subjected to heavy punishments by the maid. 9:22pm – Lolu’s diary session. 9:14pm – Tobi’s diary session. 9:10pm – Housemates are enjoying their dinner meal. 9:09pm – Khloe’s diary session. 9:01pm – Alex’s diary session. 8:51pm – Miracle’s diary session. 8:46pm – Anto’s diary session. 8:39pm – Today’s diary sessions kick off with Nina. 8:37pm – Alex picks to share share the lixury bedroom with Tobi. 8:08pm – Big Brother orders all the housemates to gather in the lounge. 8:02pm – Alex wins this week’s Head of House challenge. 5:13pm – PayPorte delivers the Housemates’s food items for this week. 4:23pm – Nina, Miracle and Cee-C are seated in the garden having a conversation. 4:15pm – Big Brother announces the housemates that have qualified for this week’s Head of House final challenge, the housemates then exit the arena and move to the garden. 3:42pm – Housemates are in the arena for this week’s Head of House qualifier challenge. 2:46pm – Nina and Cee-C are in the garden having a conversation. 2:38pm – Out going Head of House Khloe reads out this week’s Head of House qualifier challenge to her fellow housemates. 2:27pm – Alex and Cee-C have a short argument, it seems like food fights will never end in the BBNaija house. 2:11pm – Alex and Tobi start up a food argument in the lounge. 1:45pm – Out going Head of House Khloe reads out a task brief to his fellow housemates who are all gathered in the lounge. 12:33pm – Lolu, Miracle and Anto in the garden, the latter is sleeping while the two guys are having a conversation. 12:16pm – Anto and Miracle are in the garden having a conversation as the latter continues to eat his meal. 12:10pm – Miracle is seated in the garden eating a meal. 11:58am – Miracle is in the kitchen preparing sauce. 11:45am – Majority of the housemates are in their beds sleeping. 9:40am – Tobi and Alex are inside the closet room having a conversation. 9:15am – Cee-C and Nina are having a conversation in the garden. 8:59am – Finally the housemates leave the garden and enter the house. 8:50am – Housemates are in the garden waiting for Big Brother’s orders to enter the house. 8:40am – Housemates’ morning workout session comes to an end, they exit the arena and move back to the garden. 7:42am – Today’s housemates’ morning workout session kicks off. 7:40am – Housemates leave the garden and move to the arena where they meet their fitness trainer Lawrence already waiting for them. 7:34am – Housemates are in the garden as they wait to move to the arena for their morning workout session. 7:20am – Housemates are preparing themselves for today’s morning workout session. 7:05am – Some housemates are still in their beds sleeping. 7:04am – Lolu is brushing his teeth. 7:01am – Housemates have began waking up one by one. 7:00am – Big Brother wakes up the housemates by sounding various animal sounds. 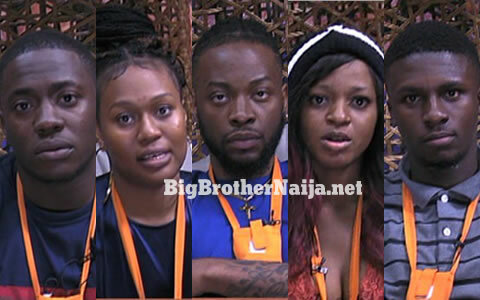 Good morning to you all and welcome to day 71 of Big Brother Nigeria Season 3, follow today’s Live Feed Blog for all the latest updates. You can as well check out yesterday’s highlights Here. Day 15: 8 Pairs Are Up For Possible Eviction This Week, Who Are You Saving?